At BlizzCon 2008 there was one booth I managed to avoid for the majority of the show, but towards the end when the crowds were clearing off I couldn't help but notice the amazing masks and accessories the folks at Rubie's Costume Company had brought along with them. Not only did they sell your standard latex elf ears and a full assortment of masks, including the $160+ full Tauren, they were even working on new masks at the booth. 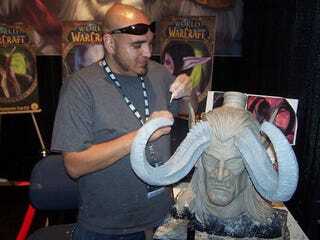 I sat and watched a guy working on the Illidan head for awhile, but I was really impressed with the detail on the Draenei being created on the other side of the booth. If not for my abject fear of putting plastic over my head, I might have been tempted to pick one up myself.